EIDOMENI, Greece — At first glance, nothing seems amiss on Greece’s northern border. Corn and wheat are slowly ripening in fields on the frontier with the former Yugoslav republic of Macedonia. Along their edges, the uncultivated dirt bursts forth with poppies and chicory. At dusk, the scene comes to life: Scores of people emerge from among the stands of poplars and plane trees that line the Vardar River. By nightfall, groups of hikers carrying backpacks and long walking sticks made from stripped branches gather at the borderline, preparing to cross north. They speak little, and only in whispers. Almost all of them are fleeing war or repression in Syria, Afghanistan, Yemen, and Somalia. Most are trying to get to Germany, where they hope to apply for political or humanitarian asylum. 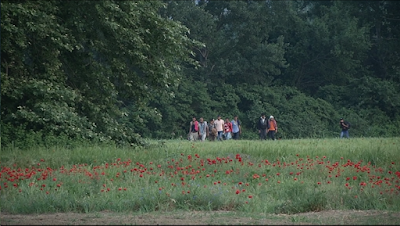 They hope to follow the Vardar valley all the way to Serbia, often walking on a freight track that follows the river’s gentle contours. 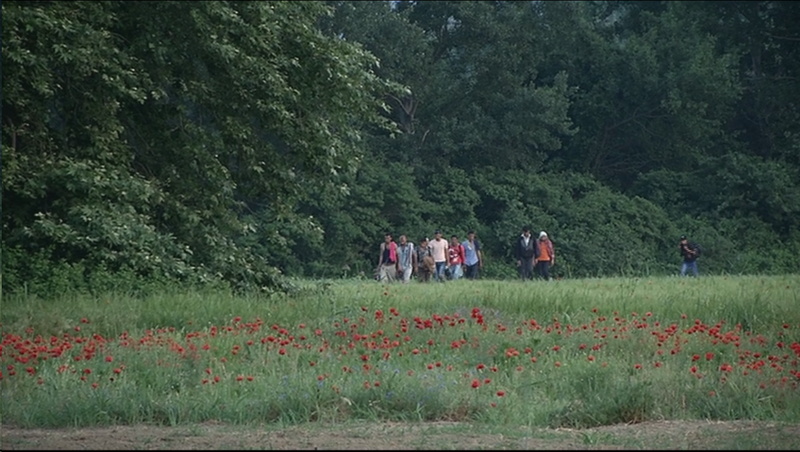 From there, they plan to walk through Hungary and Austria. The leader of one such group explained why he was there with his two eldest sons, aged 15 and 16. “I decided to leave Yemen so that I will never see my children fight for al Qaeda or any other side. Sooner or later, one militia or another will approach them.” Hashim, as he identifies himself, has had to leave behind a wife and four younger children he may never see again. On the particular night when I met him, Hashim decided not to cross. Just yards away, on the far side of a cluster of trees, we heard a loud and rushed conversation of people who clearly weren’t trying to conceal themselves. Hashim has heard of the rival gangs that prey on those travelling north for their money, mobile phones, and passports. In effect, they enforce a smuggling fee of approximately $4,000 from Turkey to Germany. Few of these people can afford it, and those who are intercepted bring back stories of ambushes and beatings. Migrants have dubbed the freight track the Black Road, because of the number of travellers who’ve been found dead on it. Evdoxia Poutpara, a doctor at the Polykastro health center some 15 miles away, has seen the wounds. The French group, Doctors Without Borders (MSF), is the only organization to actively try to assist migrants, even though, as war refugees, most are entitled to state protection. MSF has set up posts along the entire route that migrants follow. It offers them medical checkups, water, high-energy food, and sleeping bags. Many travelers have suffered war injuries. Ahmed was shot in the lower spine by a sniper in Syria, and walks on crutches. His group was lucky enough to reach the Macedonian town of Veles. “From time to time four friends carried me 100 kilometers,” he says. As they boarded a bus for the capital, Skopje, police moved in. The group found itself in Gazi Baba prison in the capital, Skopje. Migration into Europe has risen for the last two years. Flows into Greece are set to triple this year. The Hellenic Coast Guard and police intercepted 42,390 people crossing onto Greek islands from Turkey last year, which was quadruple the 2013 figure. According to the United Nations High Commission for Refugees, more than 77,000 people have crossed so far this year. “If the figures continue to go this way, we can expect an increase of three or four times,” says Ioannis Mispinas, harbourmaster on the island of Kos, which faces Turkey. “They’ve stayed in Turkey or Lebanon for a year or two. But as they see that the [Syrian] war doesn’t end, they are encouraged to leave,” says MSF’s Kyrousis. MSF calls this the “consequences of EU members’ policies that are ignoring their humanitarian duty,” and calls on European leaders to “radically revise” those policies. In response to this tsunami of humanity, the European Union is doing three major things. Migration Commissioner Dimitris Avramopoulos has announced “an emergency relocation scheme.” Under current rules, refugees and asylum seekers may only apply in the EU country where they first alight. This means that frontline states like Greece and Italy bear the brunt of asylum applications. Typically, about one in five is granted. Those who want to increase their chances must smuggle themselves deeper under Europe’s skin, as they are doing at the northern Greek border. Relocation is an effort to share the burden, but participation is voluntary. The EU is also tripling the resources allocated to Greece and Italy to police European external borders, making operations Poseidon and Triton the largest maritime policing actions it has ever undertaken. The UN High Commission for Refugees has called on the EU to “rapidly adopt” and “fully implement” these measures. Controversially, the EU also took the decision on May 18 to create a naval force to “identify, capture and destroy vessels before they are used by traffickers” off the coast of Libya. The situation off the Greek islands of the eastern Aegean is different, however, and the purely humanitarian Triton operation is invaluable. At 3 miles from Turkey, Kos is one of the closest islands—so close that the most intrepid bypass smuggling rings and paddle over in life vests and on tiny inflatable dinghies. A local boatyard that stores court evidence clearly displays the change. On one side are speedboats with powerful engines. All are riddled with bullet holes made by the coast guard. Beside them lie stacks of black inflatable rafts that have been knifed open. This is something migrants are instructed to do when the coast guard spots them. Once in the water, they are technically shipwrecked, and international law demands that they be rescued. Scores of migrants wait patiently on the quay outside the Kos police station for fingerprinting and identification. Technically, they are in police custody, but there aren’t enough cells for them. Kos recently persuaded a bank to open up a repossessed hotel to house waiting migrants. Even that, though, is overflowing. Men sleep on wall-to-wall mattresses strewn across the lobby floor. MSF tents are pitched in the garden. In a chivalrous arrangement reached among the migrants, only women and children enjoy the upstairs rooms. Whatever the perils of a journey on foot from Syria to Germany, people like Murhaf, a 38-year-old taxi driver from Hama, are determined to make it. He has been forced to leave his wife behind, because a bomb that destroyed their house three years ago disabled her. But he has brought with him his two sons and two daughters, aged 7 to 11, as far as the northern Greek border. Murhaf was thrown in jail for three months. “They beat me a lot, day and night, with iron rods that had been heated in a fire. They put the rods through my wrists and feet,” he says, showing the wounds. As he does so, his youngest daughter, Hanin, buries her face into his side and begins to sob. The perils Murhaf and his children face on their forbidden journey are enormous; but it is the horror they have left behind that drives them on. The New Athenian will be taking a break until late August and wishes readers a good summer!